With no other options, Officer Scott Grey had traded himself for the lives of some children. He then found himself fighting for his life while high above the city in a helicopter. The gang members kept trying to push him out of the helicopter, and there would be no way to survive a fall. An Alt might have been able to use their powers to save him, either by using their powers remotely, or even flying up to catch him, but there were no Alts remaining in Star Haven. They had been ordered to leave, and now the closest were across the bay in Thunder City. Then he was overpowered and the ground rushed up to meet him. Hannah Quinn had hidden in the city trying to avoid her mother, and find a way across the bay to Thunder City. She had wanted to keep her abilities hidden, but she couldn't turn away when a man landed on the roof near her. Even when she realized who and what he was. Not only a police officer, but a known Alt-killer. Learning that her mother now knew her location, Hannah ran. Back into the arms of Scott. But he wasn't simply an Alt-killer. He was an honorable man who was now on the run himself, heading into an Alt-friendly area that could be just as dangerous to him, as Star Haven was for her. 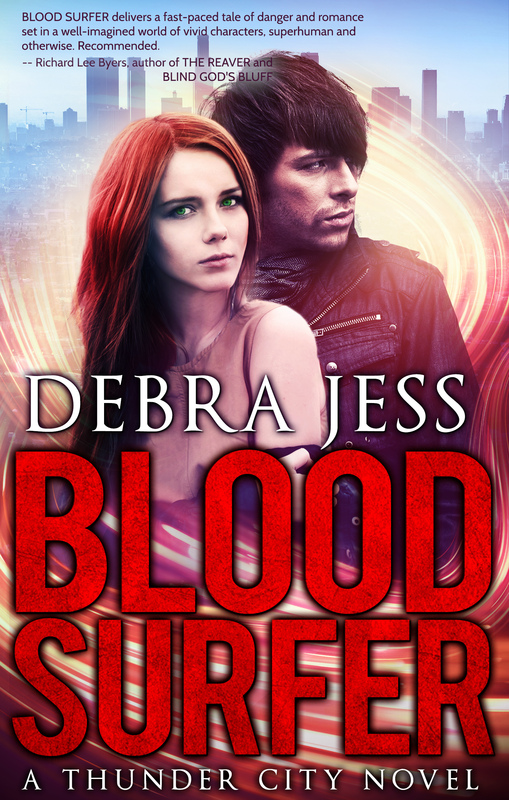 Blood Surfer is the debut novel by Debra Jess of her Thunder City series. I was absolutely engrossed in this world, how the citizens of Star Haven had turned on their neighbors, friends, family - simply because they had Alt abilities. Then how just across the bay, everyone lived in harmony. I was surprised when I realized how young this couple was, but it worked. Scott and Hannah both have to come to terms with some traumatic experiences they have had both individually, and together. In fact, I wouldn't be surprised to learn that Scott is actually experiencing PTSD. Then there is the extended cast of characters that spring to life on the pages. All of this will encourage readers to demand more stories - soon.